"If there is going to be peace and legislation, there cannot be war and investigation"
President Donald Trump told Congress on Tuesday that the economy would crash and no policy work could be done if lawmakers investigate his administration or stand in the way of his plans to withdraw U.S. troops from Afghanistan and Syria, NBC News reported. 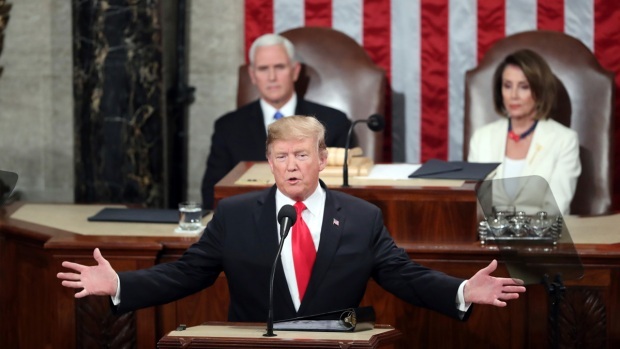 The lines, delivered early in his State of the Union address, were so clearly designed to draw cheers from his Republican allies that they even included a rhyme scheme. "An economic miracle is taking place in the United States — and the only thing that can stop it are foolish wars, politics, or ridiculous partisan investigations," he said. "If there is going to be peace and legislation, there cannot be war and investigation. It just doesn't work that way!" Instead of applause, Trump was met with steely silence.